The first records of discovering forgotten graves from the Catholic cemetery date back to the earliest homes built on the newly-graded and platted residential landscape. In her book, Growing Up With A City, originally published in 1926, Louise DeKoven Bowen wrote of workers finding bones in 1886, while digging the foundation for her home at today's 1430 Astor Street. In this book, she also recalled her experience as a child of riding through lower Lincoln Park and noticing wooden coffin parts and pieces of bones in piles of dirt in the transitioning City Cemetery grounds. UPDATES: On May 8, 2008, the Chicago Tribune reported that a day earlier workers unexpectedly encountered bones at a construction site at 1453 N. Dearborn St. According to the article, "John Mirabelli, a Chicago police spokesman, said an investigation is under way. Officials said it was possible the site where the remains were found was once a cemetery." Adapted 1870's Peltzer Atlas, showing survey plat of the grounds formerly belonging to the Catholic cemetery. 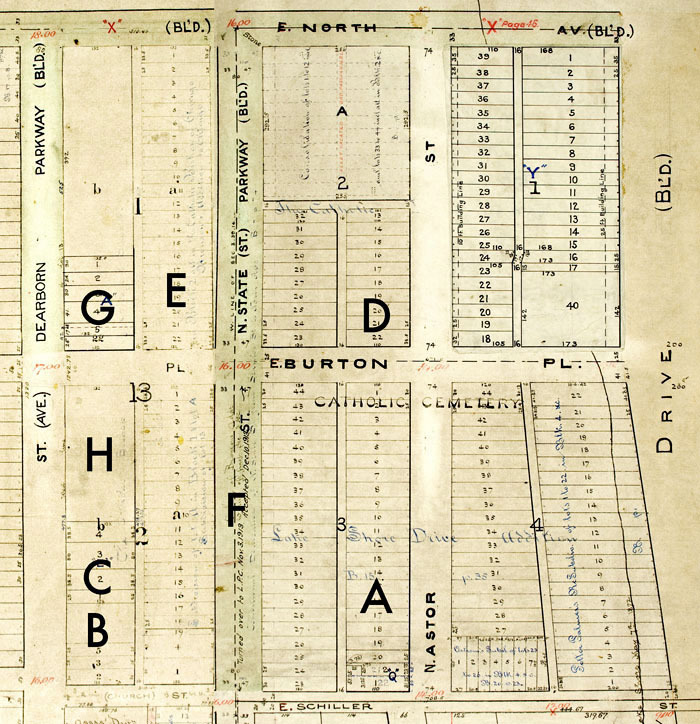 The plat shows markings into the late 1890s that represent the evolving residential landscape. Although I found only six mentions within the Chicago Tribune's pages, of the discovery of skeletal remains during Gold Coast construction and renovation, there have undoubtedly been many more similar instances. I have heard of several more examples, told to me off the record, of such occurences in this area over the last ten years. The Peltzer plat map, reproduced above, courtesy of the Illinois Regional Archives Depository at Northeastern Illinois University, shows the evolving survey marks as the area became newly subdivided. The hand-drawn line running vertically to the left of the east (right) edge marking Lake Shore Drive, indicates the original 1872 shore line when the grounds were graded and filled for the construction of the Drive. The line is interrupted at the edge of Burton Place because the block above it is a newer, pasted-in portion of the map. The large black letters on the map indicate places where skeletal remains were found, as indicated in the stories at the left of this page. "F" and "G" refer to stories that only mentioned findings in the middle of that block. A - 1886: 1430 Astor Street, during construction of the home of Louise DeKoven Bowen. B - 1894: described as "the flat building just south of the place where the bodies were found yesterday" in the article mentioning 553 Dearborn St.. The article mentions a third find: "Fairly well preserved skeletons were found when the cellar for a residence in the same Dearborn avenue block was dug." C - 1894: 553 Dearborn Avenue (now 1429 Dearborn Street), while "excavating for a cellar." D - 1900: Victor Lawson bought this parcel from the Archbishop in 1900, the last sale within the grounds for several years. 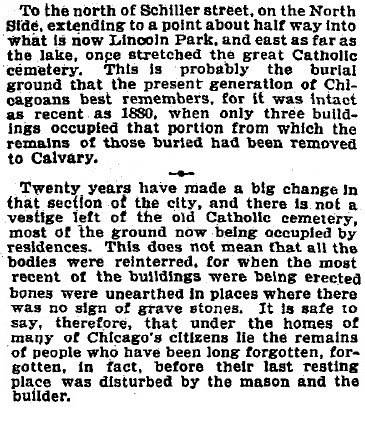 The October 7, 1900, Tribune article says, "... when the most recent ofthe buildings were being erected, bones were unearthed in places where there were no signs of gravestones." E - 1947: 1520 State Parkway, skeleton found "buried beneath 18 inches of soil." F - 1971: bones found while digging for a water line in the middle of the 1500 block of State Parkway. G - 2004: bones found during "backyard renovation" on Dearborn Street. H - 2006: 1447 N. Dearborn Street, during construction. UPDATE - NOT ON MAP: May 7, 2008: 1453 N. Dearborn Street, during construction. Although there was much new construction on the graveyard site over the next two decades, the Chicago Tribune did not mention any more surprise findings for nearly fifty years. On June 1947, in a article titled, "Records Hint Skeleton is From Old Cemetery", the unnamed writer says: "City records indicated yesterday that the area around 1520 State pkwy., where a skeleton of a man was found Monday buried beneath 18 inches of soil, was a cemetery many years ago. Nails found in the shallow grave also indicated the skeleton may have been buried in a normal manner and the original coffin may have disintegrated. The shallowness of the grave, police believe, may have been caused by leveling of the ground for building purposes." In a February 28, 1971 Chicago Tribune artice by William Mullen, titled, "State Street Skulls No Mystery, Just Oversight", he recounts the history of the cemetery grounds, while telling of a surprising find: "First it was a skull, and then some bones, then another skull. Before they were finished, the workers uncovered three skulls and the partial skeletons of three human beings. Startled, they called the police." Mullen also writes, in talking about the Gold Coast area and the Lincoln Park grounds, "Tho it is not common, every few years, the oversights of the sextons are uncovered." In an August 2004 short piece, called "Do You Live in a Cemetery? ", for Chicago's CBS2 television station, reporter Diann Burns reported that during the previous June, bones had been found during a "backyard renovation" on Dearborn Street in the old Catholic cemetery area. On October 24, 2006, in an unattributed article, a Chicago Tribune writer said: "Chicago Police are investigating after workers found what appeared to be human bones at a Gold Coast construction site at 1447 N. Dearborn St."